As we all know that 17-02-2018 onwards SSC CGL 2017 Tier-2 exam has been started. Many Candidates has already appeared for this exam on the day one and many more will appear in it today (18.02.2018) and on upcoming days. In this post, we have given overall exam review and questions asked on SSC CGL 2017 Tier 2, based on Students Feedback and Memory. Exam duration is of 120 minutes (2 Hour). SSC is very strict about punctuality, the aspirants reached after 10:00 a.m. for Maths) were not allowed. The overall review regarding SSC Server was good. Server Speed was quite improved and better than previous years. This time SSC took it very sincerely. There were multiple frisking and it was done properly. Lab assistants were also active in most centers. Level of paper 1 (Maths) was Moderate. 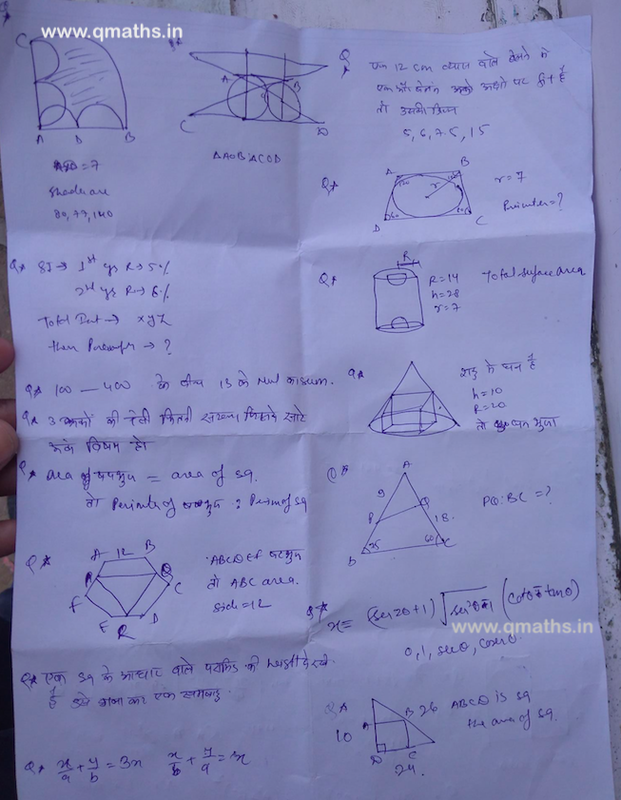 Paper seems to be of similar difficulty level as seen in the previous day (17th) of SSC CGL 2017 T2 Exam. Questions asked were New, and this is the reason aspirants found the paper to be on the tougher side. There were no direct formula-based questions, Every Question needed Analysis, Inferences and Quick Calculation. We advise having basics clear questions asked are non-repetitive and based on concepts. It's time to revise the basics of Advance Maths. Ideal attempt 70-80 with 90% accuracy. Arithmetics questions were of easy to moderate level. Questions on Mensuration were lengthy, calculative and New Type. Trigonometry Questions were a bit tricky and time- consuming. A lot of Questions had diagrams and had calculative or time-consuming questions. Height and Distance were easy. Q. 9) A point made an angle of elevation to the top of a tower with the tangent of 3/4. If point shifts 300 meters towards tower then the tangent becomes 4/3. 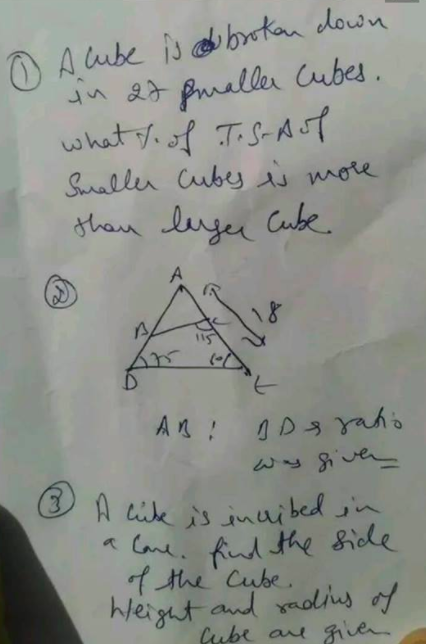 What is the height of the tower .qmaths.? Q. 10) Average of the number from 100 to 400 which are divisible by 13. Q. 11) Two men start walking towards each other with speed of 21 km/hr and 24 km/hr. If they meet after 1 hr 15 mins, Whats the distance between them initially. Q. 13) A man buys 5 sarees of avg cost 2250. If he had bought 3 more sarees the avg cost would have been 2750. Whats the avg cost of all sarees together. Q. 14) A mixture contains acid and water in the ratio 11:2. If 35 liter of water is added the quantity of acid becomes twice in water. Whats the initial quantity of qmaths acid. Q. 15) A cylinder of height 8 cm and radius 3.5 cm is perfectly put inside of another cylinder with their axis perpendicular to each other. Whats the radius of another cylinder. Q. 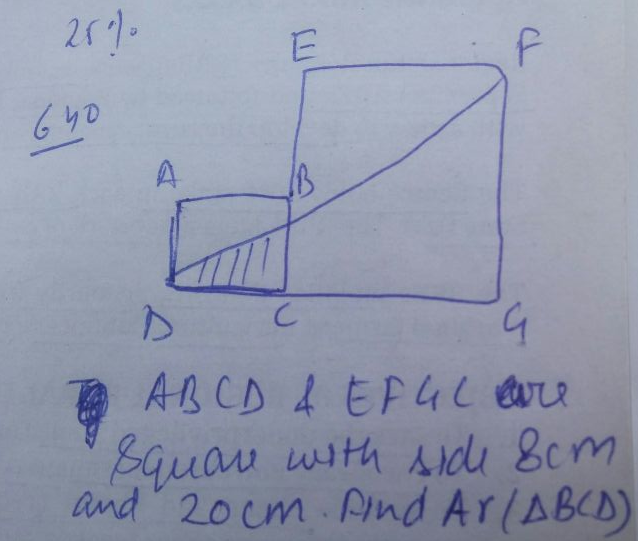 16) If a cube is cut in 27 equal cubes. Whats the percentage change in the total surface area. Q. 17) Two men start walking towards each other with speed of 21 km/hr and 24 km/hr. If they meet after 1 hr 15 mins, Whats the distance between them initially. We'll update this post with more questions as soon as we receive feedback from candidates.